What do you do in a world class ski town when the snow melts? You take a hike! Mountain climbing, skiing and hiking are all available at Adventures To the Edge. Guided summer and winter trips including hiking, rock climbing, mountaineering, snow-shoeing, cross country ski instruction and tours, backcountry skiing, and more. Enjoy your mountain vacation in Snowmass! Year round ski and summer resort located just outside Vail CO.
"Aspen's Adventure Sports School since 1996", offering private, fully customized all-inclusive adventures, with Aspen's most experienced instructors. The Ute Mountaineer is the local's & visitor's choice for all of your outdoor equipment and clothing when coming to the Aspen/Snowmass area. With more than 2000 miles of maintained trails in and around Aspen Valley, the options for hiking and backpacking trips are endless. Local outfitters can help you plan and prepare your wilderness expedition, while professional guides can bring along the backcountry expertise you may need on your trip. Hiking destinations include 14000 foot summits and high-altitude glacial lakes. Aspen is famous for a certain "richness." The town, situated in the Roaring Fork River Valley and surrounded by mountains for miles and miles, has a vast wealth of natural beauty. Most of this natural beauty has been designated protected land under the jurisdiction of United States Forest Service and Bureau of Land Management, both of which maintain public access trails and roads for you to hike freely! Interested in an afternoon hike? A good, full-day trek? A multi-day peak-bagger expedition? For information on weather and conditions, as well as where to go, contact White River National Forest's Aspen Ranger District office at (970) 925-3445. Depending on the previous year's snowfall, hiking season starts in June and ends (for most) with the first snows in October. And, remember: safety first. Be informed and be prepared for drastic shifts in weather conditions. 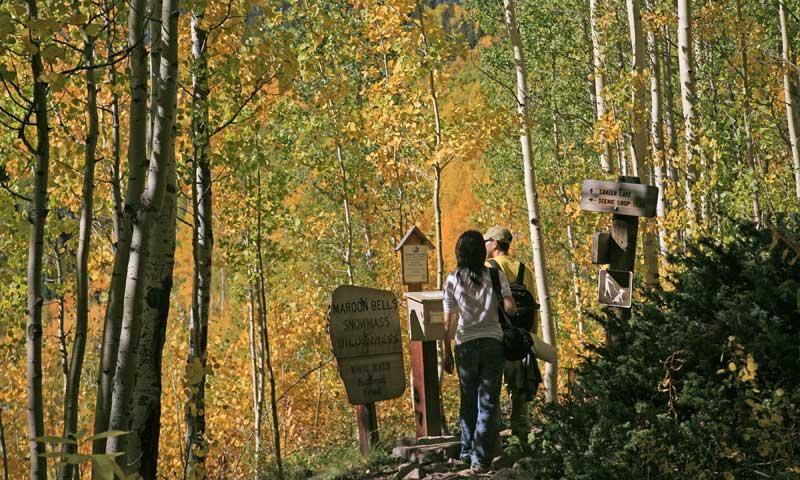 With convenient access from the town of Aspen, this easy hike offers fun for the whole family. The trail, which you can hop on at N. Mill Street just north of Rio Grand Park, follows the route of the old Denver and Rio Grand Railroads. A heavily used path, this trail stretches 20 miles from Aspen to Woody Creek to Old Snowmass on through Basalt and Emma. From Maroon Creek Parking Area, the trail follows Maroon Creek past Maroon Lake, through meadows and up a scree field, and on to Crater Lake (measuring 1.8 miles). With 500 feet elevation gained, this is a great hike to get your sea legs ready for recreation above 10,000 feet. Be aware that, during the summer season, access to the Maroon Lake Recreation Area is limited to Roaring Fork Transit Authority buses and nonmotorized vehicles. But, don't fret: these buses are easy to find. Go to https://www.fs.usda.gov/recarea/whiteriver/recarea/?recid=82346 for more information. As the name suggests, this trail is no walk in the park. Measuring 3 miles one-way with 1200 feet elevation gained, this moderately strenuous hike will demonstrate the granduer of the valley. Trailhead can be found at Difficult Campground east of Aspen on Highway 82 (Independence Pass Road). This "loop" trail (it's more like a horseshoe, actually) has a trailhead at Lost Man Campground (on Highway 82, 14 miles E of town) and a trailhead on the last switchback before Independence Pass summit. The distance between these two points is 4 miles, making for an easy shuttle for this spectacular hike (just under 9 miles). The trail leads hikers past Lost Man Reservoir and Lost Man Lake with about 1200 feet gained in elevation. Prepare for some steep, strenuous hiking. Ah, but the reward: epic views of Aspen Valley. Need a map, a pair of socks, a guide? Visit any of Aspen's local outdoor gear outfitters and guide services for the maximum mountain experience in the valley. Based in Aspen, Colorado the 10th Mountain Hut Association is a series of backcountry huts connected by over 350 miles of trail. Explore the great outdoors that surround Aspen with the Colorado Mountain Club. A list of the greatest hikes in the world, including the Continental Divide. An organization that strives to protect the wild lands of the Colorado Trail.